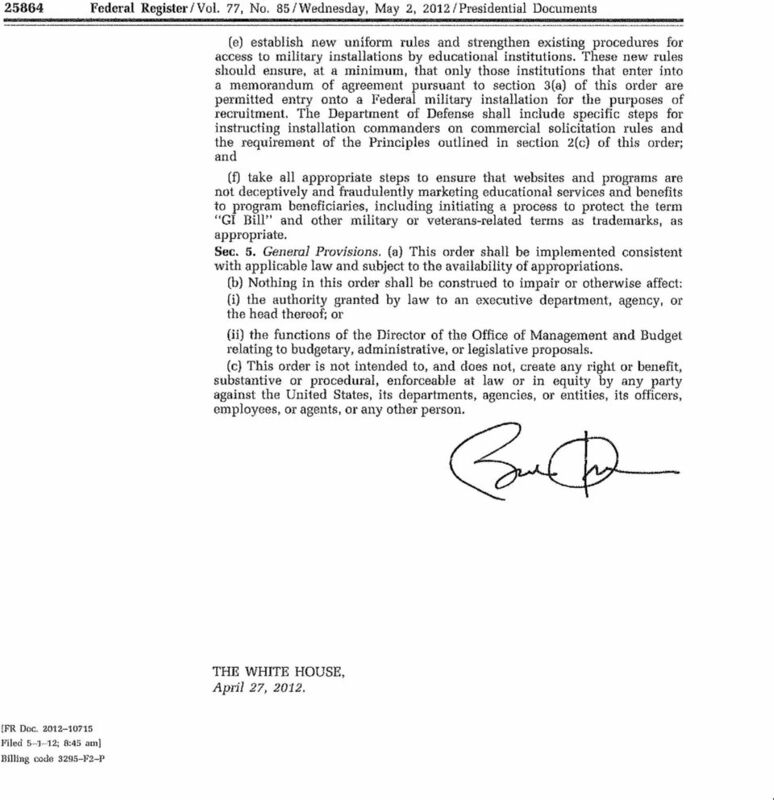 Download "DEPARTMENT OF VETERANS AFFAIRS (VA) Veterans Benefits Administration Washington, D.C. 20420"
2 Federal Register I Vol. 77, No. 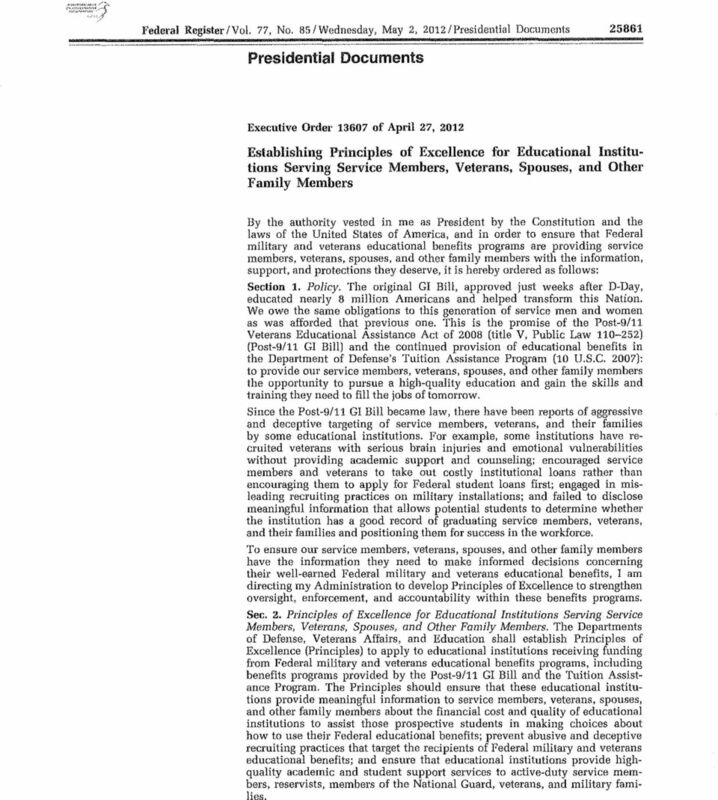 85/Wednesday, May 2, 2012/Presidential Documents Presidential Documents Executive Order of April 27, 2012 Establishing Principles of Excellence for Educational Institutions Serving Service Members, Veterans, Spouses, and Other Family Members By the authority vested in me as President by the Constitution and the laws of the United States of America, and in order to ensure that Federal military and veterans educational benefits programs afe providing service members, veterans. spouses, and other family members with the information, support, and protections they deserve, it is hereby ordered as follows: Section 1. Policy. The original GI Bill, approved just weeks after D-Day, educated nearly 8 million Americans and helped transform this Nation. We owe the same obligations to this generation of service men and women as was afforded that previous one. This is the promise of the Post-9/11 Veterans Educational Assistance Act of 2008 (title V, Public Law ) (Post-9/11 GI Bill) and the continued provision of educational benefits in the Department of Defense's Tuition Assistance Program (10 U.S.C. Z007): to provide our service members, veterans, spouses, and other family members the opportunity to pursue a high-quality education and gain the skills and training they need to fill the jobs of tomorrow. Since the Post-9/11 GI Bill became law, there have been reports of aggressive and deceptive targeting of service members, veterans, and their families by some educational institutions. 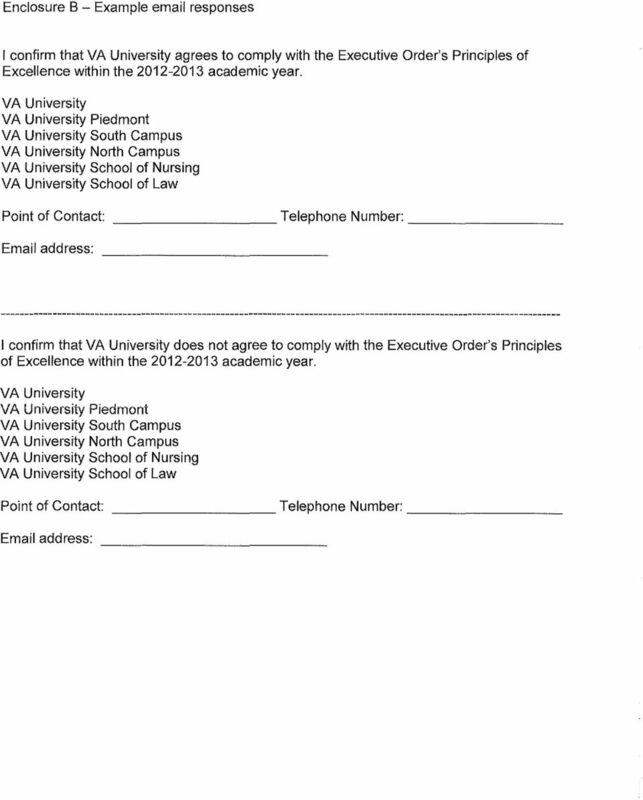 For example, some institutions have recruited veterans with serious brain injuries and emotional vulnerabilities without providing academic support and counseling; encouraged service members and veterans to take out costly institutional loans rather than encouraging them to apply for Federal student loans first; engaged in misleading recruiting practices on military installations; and failed to disclose meaningful information that allows potential students to determine whether the institution has a good record of graduating service members, veterans, and their families and positioning them for success in the workforce. 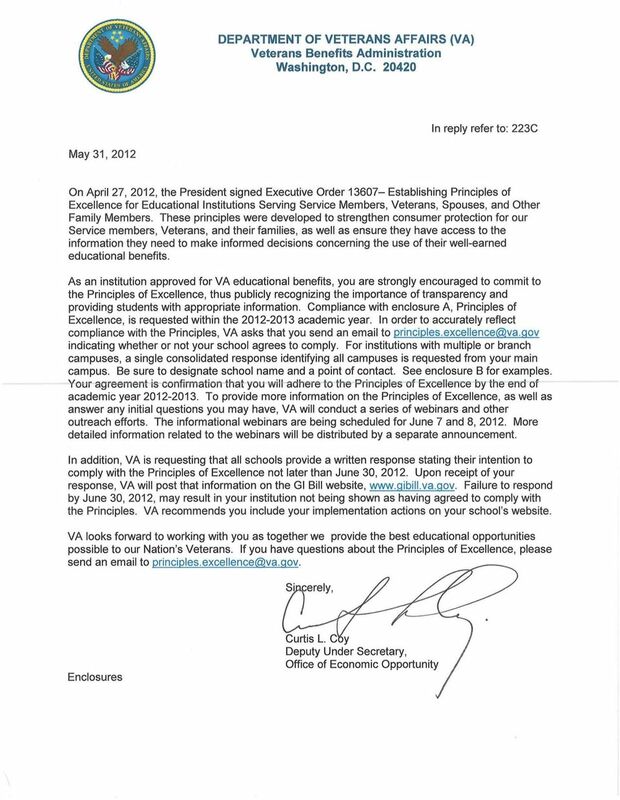 To ensure our service members, veterans, spouses, and other family members have the information they need to make informed decisions concerning their well-earned Federal military and veterans educational benefits, I am directing my Administration to develop Principles of Excellence to strengthen oversight, enforcement, and accountability within these benefits programs. Sec. 2. Principles of Excellence for Educational Institutiolls Serving Service Members, VeteraIls, Spouses, and Other Family Members. 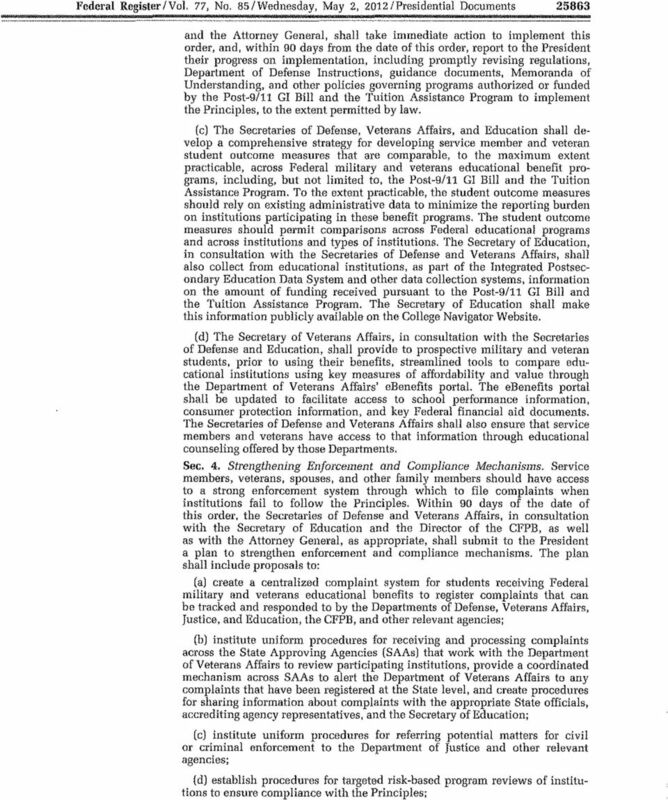 The Departments of Defense, Veterans Affairs, and Education shall establish Principles of Excellence (Principles) to apply to educational institutions receiving funding from Federal military and veterans educational benefits programs, including benefits programs provided by the Post-9/11 GI Bill and the Tuition Assistance Program. 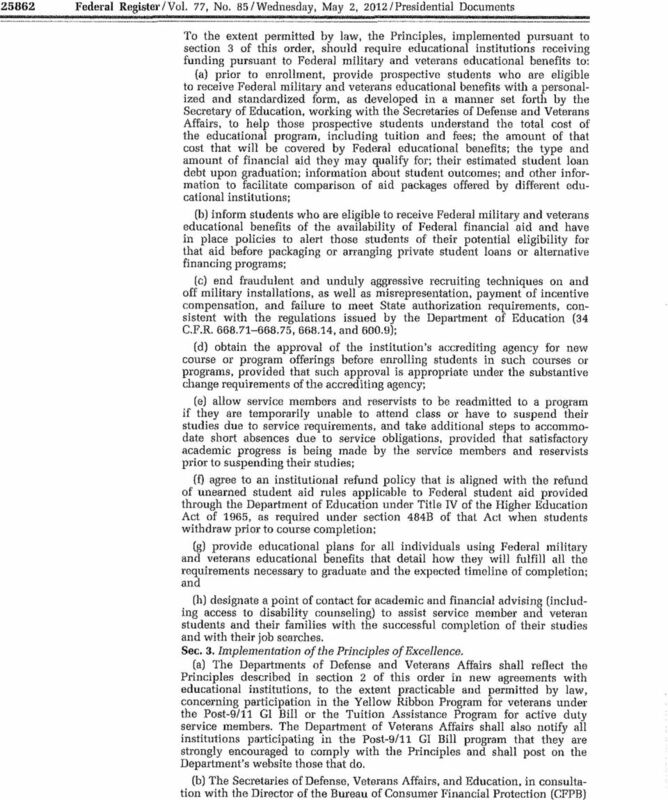 The Principles should ensure that these educational institutions provide meaningful information to service members, veterans, spouses, and other family members about the financial cost and quality of educational institutions to assist those prospective students in making choices about how to use their Federal educational benefits; prevent abusive and deceptive recruiting practices that target the recipients of Federal military and veterans educational benefits; and ensure that educational institutions provide highquality academic and student support services to active~duty service members, reservists, members of the National Guard, veterans, and military families. 3344-86-01 Principles of excellence for veterans education. SEC. 581. ADDITIONAL MEMBERS OF DEPARTMENT OF DEFENSE MILITARY FAMILY READINESS COUNCIL. 4. If two or more eligible students have complete applications on the same date, single parent students will be funded first.